Hartlepool United goalkeeper Scott Loach says he and his team-mates must target a result at Sutton United tomorrow in their bid to seal safety in the National League. Pools have just four games left in the campaign, with the final match in just over two weeks’ time. And midweek results for some of Pools’ relegation rivals left caretaker boss Matthew Bates’ men looking over their shoulders ever more nervously. Both Solihull Moors and Barrow won on Tuesday to crank up the pressure. Second-bottom Chester are already relegated, while rock-bottom Guiseley need a miracle in their six remaining games. Third-bottom Torquay United also face a mountain to climb – and could be relegated by the time they visit Pools next Saturday. So it looks like the final relegation place will go to one of five teams – between Pools (P42 Pts48), Solihull Moors (P42 Pts47), Maidstone Utd (P43 Pts47), Woking (P43 Pts 45), and Barrow (P41 Pts 44), who currently occupy the unwanted 21st place in the league. 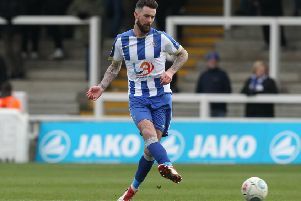 Depending on results tomorrow, Pools could find themselves just one point above the relegation spot after the trip to third-top Sutton United. Keeper Loach says the players know it is in their hands to get out of trouble – but after successive home defeats to teams below them in the league (Guiseley and Solihull Moors), the team is not in the best of form. “Anyone can go on a run, we did it,” said the 29-year-old. “It’s no good people saying ‘Barrow need to win three or four’. I’ve been in this league before at York when Guiseley went and won five in a row. Loach said the players were angry at Saturday’s defeat, which – like the Guiseley defeat – came after a late goal. “It was massively disappointing,” he said. “There was a lot of anger in the dressing room – but there’s only us who can get us out of this. “We’d turned a corner, and you would have thought the last two games would have been there for the taking, but, unfortunately, we’ve not done that. “We’re lucky that other results went our way (on Saturday), but we need to get that win and get it soon otherwise all that work Batesy and his coaching staff has done is going to go unnoticed. “Game management was not good. No disrespect to the teams, but I think when we are playing Guiseley or Solihull that we have to win it. “If we’d drawn both 0-0 and come out with two clean sheets, they might not have been the results we wanted, but the table would have looked completely different. “On Saturday, they had the better chances. We were better in the second half, but we didn’t create enough. Loach is now looking for the squad to be professional and get the wins they need. “We’re disappointed, but I’ve said before, when we’ve been on good runs, there’ll come a time when we lose. It’s about how you react now. “Since Batesy took charge and brought in his coaching staff, the place has been brilliant. “The boys really want to work for him and want him in full-time, we think he’s the right man for us, but we’ve got to give him the performances. “They’ve given us everything and the last two performances have been a bit lack-lustre. After tomorrow’s game, Pools host mid-table Leyton Orient on Tuesday night and then strugglers Torquay on the Saturday. The final game is a tough trip to Tranmere Rovers, who are now second-top.